Here in the PNW, school doesn't start for close to another month, but I've been seeing my friends' children starting already in Hawaii and very very soon in other states. Do you have any little ones starting preschool or kindergarten this year? 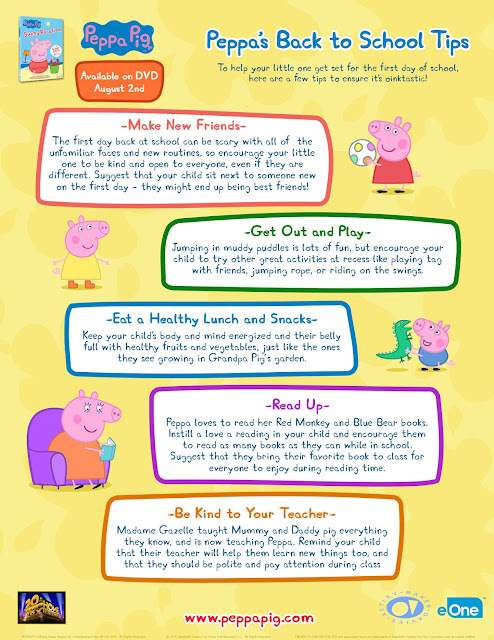 We've created a fun Peppa Pig themed lunch to help keep your littles excited for their first day. 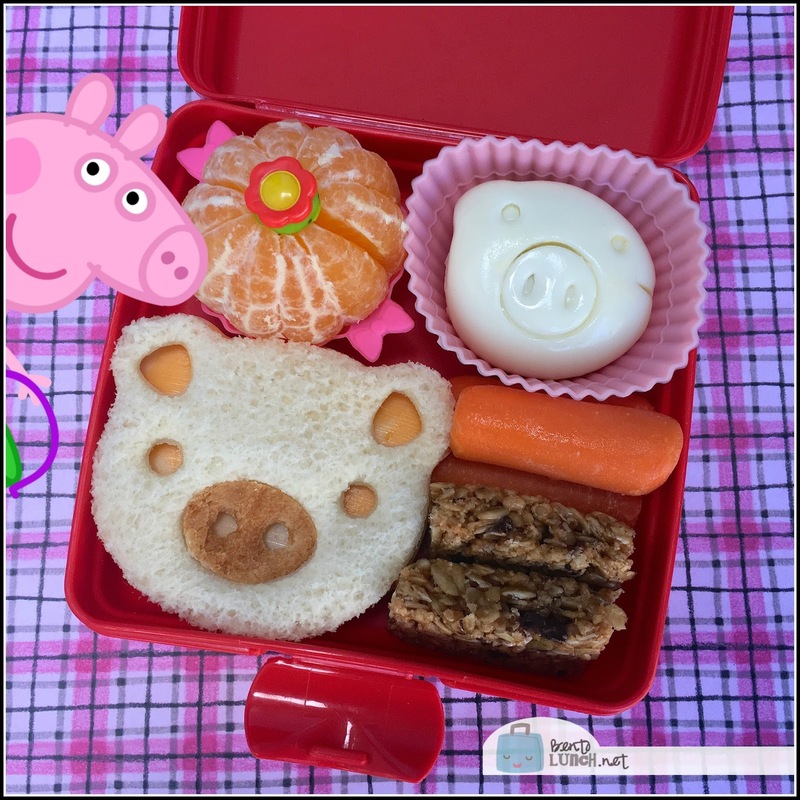 In this lunch, we used our CutezCute sandwich cutters to make a pig shaped sandwich. I used white wheat to form the base, then recut the nose area from the crust of the bread. Since I'm the only one who likes the crust, I can spare a little circle out of it. We made the rest of the sandwich from ham and marble cheese and tucked it into the bottom corner. I also redid a plain boiled egg into a piggy shaped egg but soaking it in hot water for about 15 seconds, then popping it into a mold and chilling it again for 10 minutes to change shape. Usually I make them in advance, but this is a quick trick to change shape if you only have plain eggs. I placed that in a silicone cup so it would touch the rest of the food. I filled out the box with a clementine orange, peeled and placed in a muffin cup to keep it separate, a granola bar cut in half, and a few carrot sticks to help keep everything in place. 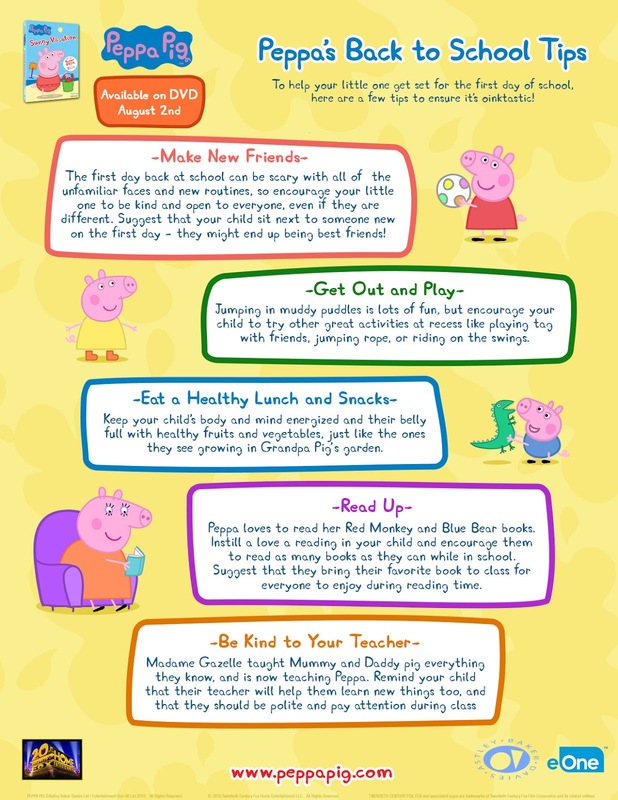 We also have fun Peppa Pig tips for first day and some cute printable Peppa Pig lunch notes you can add to the box. Both sheets below are clickable for larger versions you can print at home. We also have a copy of Peppa Pig Summer Vacation to share with one lucky reader! Use the Rafflecopter below and leave me a comment telling me what your favorite back to school lunch tip is. For more entries, you can tweet about the giveaway. Disclosure: Fox Home Entertainment Insiders provided me with the information above and a copy of Peppa Pig Summer Vacation for the purposes of this giveaway, all opinions are my own. We love Peppa!!! What adorable lunch box notes! Variety and be creative!!! Kids love colors and fun! Pack small portions and keep it colorful! Prepare the night before, especially if you have 3 or more kiddos you have to prepare a lunch for.